The four Welsh Regions - Blues, Ospreys, Scarlets and Dragons - were created in 2003. 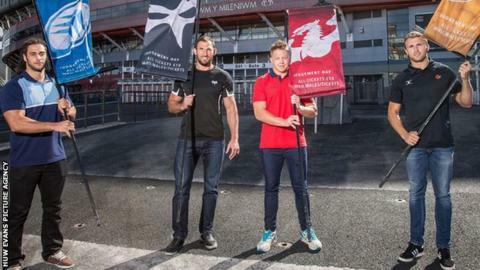 The four Welsh rugby regions have raised the amount they can spend on players' wages by £1m to £4.5m. In December 2011 the regions - Cardiff Blues, Dragons, Ospreys and Scarlets - imposed a salary cap of £3.5m a year when all four were posting losses. The rise reflects improved finances, with extra money from Europe and a new deal with the Welsh Rugby Union. Pro Rugby Wales declined to comment, but it is understood the decision was mutually agreed after a review. It is hoped the extra cash will help the regions retain star players and potentially bring more "Welsh exiles" home. Leigh Halfpenny, Jonathan Davies, George North and Luke Charteris are thought to be considering returning to Wales next season. The Ospreys are hoping Dan Biggar and Alun Wyn Jones will agree to extend their current National Dual Contracts. However, the regions - represented by Pro Rugby Wales - are expected to make building squad depth a priority, and not necessarily spend big figures on marquee signings. The new ceiling - which is self-imposed - is still some way below that of England's Aviva Premiership. Premiership Rugby Limited - the umbrella body that governs England's Premiership clubs - announced in October they would be raising their cap next season from £5.1m to £6.5m, and to £7m the season after that. These figures exclude the salaries of two so-called "marquee signings" that remain outside the cap.